Thread: Wildcat factory two tone??? This is my first post on the forum! 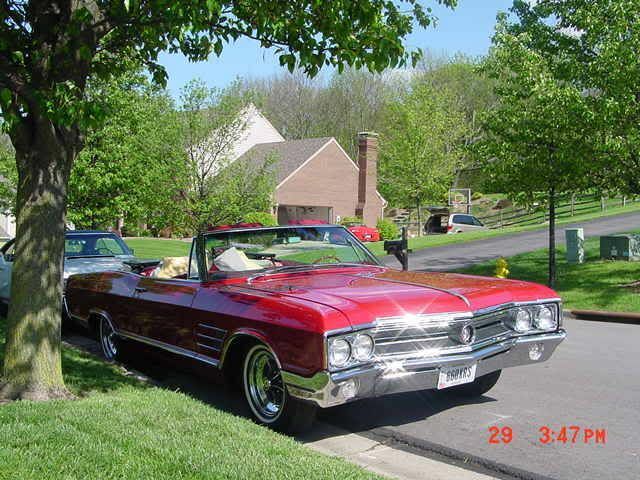 I have a 1965 Wildcat convertible. It?s currently a light resto-mod but I?m looking to put it back to all original. The car is currently some custom ferrari(ish) red color with a white interior and a white top. My ID tags and such under the hood indicate that it was a dark gray and black two tone from the factory? Obviously there is nothing wrong with the tag but I have never seen a two tone Wildcat (other than custom jobs) so I have no other evidence to substantiate this. I have a catalogue from 65 that shows all of the colors but it does not show what the two tone would have looked like. If anyone could shine some light on this issue for me it would be greatly appreciated! could you show the letters/numbers on the trim tag? 65 we did not have a dark grey, only Silver Cloud (Z) in the grey tone. There was not an option for 2 tone paint on the convertibles. On Coupes and Sedans the top could be painted or vinyl. I look forward to seeing some pictures, and welcome to the site! I have several Wildcats in the garage. as of october the car has been off in storage because I dont have space in the garage for it in the winter. this means i cant see the trim tag but i remember that it was that silver cloud color and the black color. on the right hand side of the trim tag against the fire wall it had what i seem to recal was two seperate 2-digit letter or number combinations and in my repair manual for the car is said if it had two sets of those codes it was a two tone which didnt make any sense to me. hopefully that little bit of info is helpful for now becasue the car wont come back out till late april maybe even may. but I will attach a picture of it. Ted, could the two tone trim tag be mentioning what color the convertible top is supposed to be? 2008 BPG Nationals BCO Race Champion! For coupes and sedans the code usually is presented with 2 letters - even if they are the same- C-C is white all over. Now this is just my opinion. The color it is right now is the most sot after color combo going. Man, that car looks SHARP!!!!! "If I can't get it, you don't need it!"